Leafy Bexley offers suburban living, ideal for families seeking a quieter place to live. Rentify can help you make the most of your letting with our handy borough guide. At Rentify we have property specialists dedicated to Bexley, armed with local expertise and unmatched valuation knowledge to find you the right tenants. Bexley is a favourite among families, sitting firmly in London’s commuter belt. The borough offers lots of space to bring up children, as well as excellent local schools. One of London’s greenest boroughs, Bexley has over 100 parks and green spaces including the popular Lesnes Abbey Wood and Danson Park. Thamesmead, the borough’s newest district, is currently undergoing a significant investment programme bringing new amenities such as a £5 million community centre to the area. For commuters, suburban rail services run regularly to Charing Cross, Cannon Street and Victoria stations, offering easy access to central London. Abbey Wood will also benefit from Crossrail services from 2018, with journey times to Bond Street averaging just 25 minutes. Flats make up around 41% of Bexley’s housing stock, however there’s a significant number of detached, semi-detached and terraced houses available too, sitting well with high demand from families looking for a more spacious home. Bexley's many districts each have their own character, catering to a variety of residents. Here's our top picks for new landlords in the area. 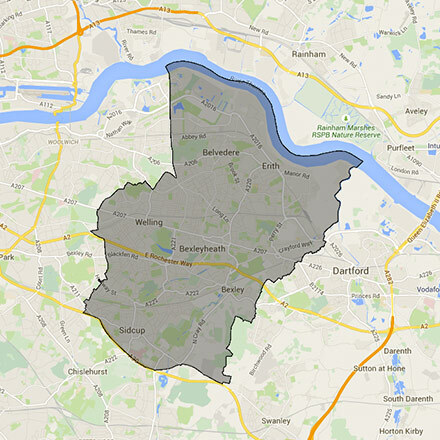 This borough covers the DA1, DA14, DA15, DA16, DA17, DA18, DA5, DA6, DA7, DA8, SE18, SE2, SE28 and SE9 postcodes. Rentify uses proprietary methodology for data collection and processing. Borough data is collected from Rentify's property database and external public sources.